Durable construction is ideal for frequent reference. 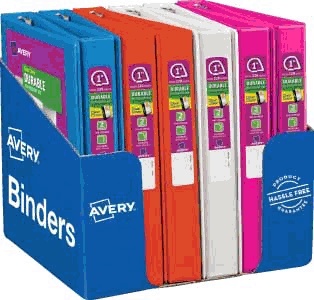 Wide front and back binder panels fully cover standard dividers and sheet protectors. Organize and secure paper with four stacked pockets. Pages lie flat with back mounted rings. Exposed rivets on back. Each holds 81/2" x 11" documents, unless indicated otherwise. 40% post-consumer content.